Lt. Commander Stewart took charge of the efforts to hail the Bombay. Dressed only in shirt sleeves and without a hat, Stewart sprung onto an arms chest; yelling through cupped hands “Heave to, you have cut us down.” Bombay continued to retreat into the distance. With no help forthcoming, Stewart led an unavailing search for the blue lights and rockets which would signal a ship in distress; they’d been stored carefully in the stern, the very part of the ship which Bombay tore from Oneida. Desperate now to attract attention, Stewart and Ensign Adams decided to fire the Parrot gun. With the key to the arms locker resting in the pocket of one of the men washed overboard, it took precious minutes to force the door to the arms locker. Stewart and Adams managed to get off three shots in as many minutes before the tilting deck and gravity caused the gun to come loose from its moorings. It crushed Ensign Adams as it careened backwards, killing him instantly. Williams ordered boats that remained filled, and Suddards took charge of the port side cutter. Already it was dangling by its davits. Coal heaver Robert Dyer and Landsmen George W. Kaufman jumped aboard at the last moment, and fastening ropes cut away. 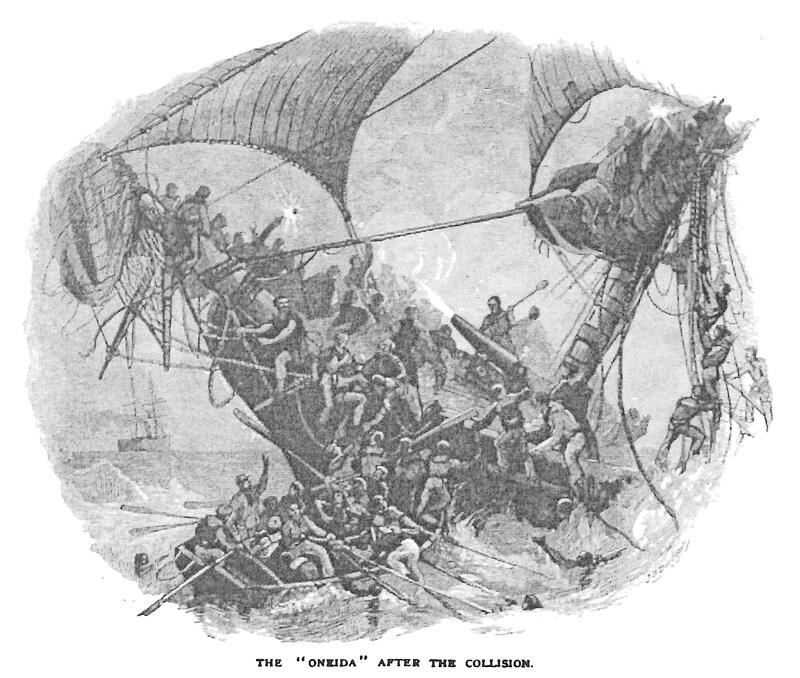 In the hurry to get clear, the cutter struck Oneida’s side, severely damaging it. With the cutter in danger of sinking, they pulled for the Western shore. The Captain ordered Copp to the berth deck to help the wounded top side. Copp quickly completed the assignment, but refused to abandon his post, even when a fellow officer shouted down to him that Oneida would sink in a few moments. Copp responded “I will stay until relieved.” Orders relieving him from his post never arrived, and Copp died where he stood. Moments before Crowinshield hit the water he shed his overcoat, a desperate struggle against the Oneida’s vortex brought him to the surface directly besides Yates’ cutter. The men hauled him aboard, sputtering and chilled. Yates spotted Stewart as well, from across the water Stewart appealed in desperation; “Yates, for God’s sake save me.” Yates ordered the men to row backwards to reach Stewart, they were only a few feet from him when he sank beneath the waves. Other sailors managed to come alongside, and the boat filled rapidly. Aided by their crewmates, men who could not fit into the overloaded cutter tied handkerchiefs to the gunwale and hung on with fingers rapidly stiffening in the frigid air. Designed for only twenty-five but with forty aboard, the cutter rode low and took in water. Yates ordered the men to bail with boots, hats, and whatever else came to hand. With his cutter in dire straits, Yates overcame his desire to keep searching for survivors. Reluctantly he ordered the men to row for the lights of a small Japanese village on the Eastern shore. It took them over an hour to make the trip. Grounding the cutter, the survivors stumbled to ashore beneath the village; Yates and his men collapsed in exhaustion. Suddards’ trip proved easier, the Western shore was closer to Oneida and his cutter carried fewer men. Clinging to the hope that Oneida may have grounded in water shallow enough that some of the crew might survive, Suddards and Ensign Anderson began walking towards Yokohama. Neither of the two men wore enough clothing for an eight hour hike over three mountains in below freezing temperatures. Benumbed by cold and barely able to stand, they arrived in Yokohama at 3:00AM. Suddards pounded on the door of an American merchant whom he considered a friend, Mr. Carroll. Once inside, Anderson collapsed, but Suddards mustered his last reserves of strength and escorted by Carroll, took a boat out to Idaho. They reported the collision to Captain Muller, and then steered to the Ocean. Ocean’s crew helped Suddards aboard, and he passed out in the Captain’s quarters. Less than an hour after the collision, Bombay arrived in Yokohama Harbor. She behaved suspiciously. Her captain, Arthur Wellesley Eyre, anchored far out in the Bay, and away from the prying eyes of those aboard the various merchant and naval vessels closer to shore. One of Ocean’s lieutenants, aboard Bombay to pick up the mail, heard Eyre state, “I have cut the quarter off a damned Yankee frigate. Serves her bloody well right, she crossed my bows with a starboard helm.” A few of Bombay’s officers, over brandies at the International Hotel, let slip word of the collision, and were overheard stating that not stopping to verify that Oneida was not sinking was a mistake. Not until Suddards arrived did Yokohama begin to stir itself. Bombay was the only ship in the harbor with her steam up, but Eyre refused to sail. Only when dual orders from the Pearl and Orient offices and the British Navy arrived did Eyre agree return to the scene of the collision. Eyre’s efforts and those of the Sylvia, Ocean, and Vsadnick could not help Oneida’s crew. The few survivors not fortunate enough to find a spot on board the cutters perished hours before any of the erstwhile rescuers arrived. How can we despair of a country that can breed such sons? The brave old blood of the sea kings still runs in our veins. The calm courage of our grand Celtic Saxon race, which has looked death proudly in the face so many thousand times since our wandering sires left the great plains of Central Asia, still when the occasion comes gleams out of our eyes. We may make mistakes on our political theories and policies, but while that indomitable spirit still runs in the blood of the race, who can despair of the Republic? In Yokohama too people talked of lynching Eyre; to forestall mob justice the Peninsular & Orient Company requested an immediate Court of Inquiry. Two questions were before the court; 1) Was the collision between Bombay and Oneida occasioned by any fault of Mr. Eyre or his officers? and 2) After the collision had taken place did Mr. Eyre do his duty? At the outset, the Court warned Eyre anything he said could be used against him in a prosecution for murder. 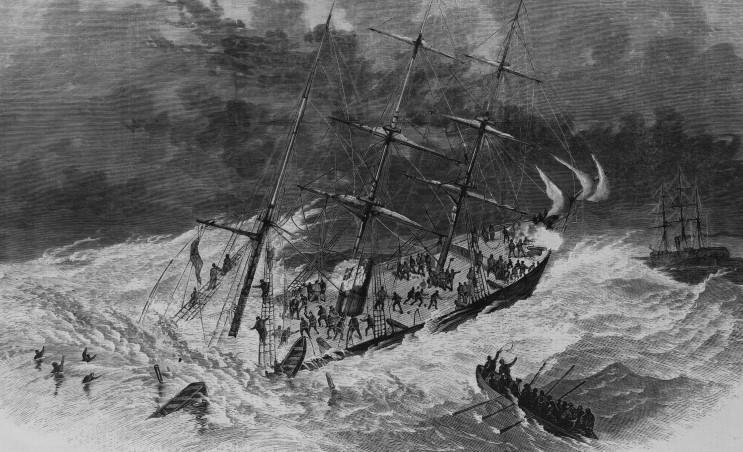 Wisely, Eyre stuck to his story and kept it short: He had been following the rules of the road; the collision was not his fault; he did not think the collision was serious; and had no reason to believe that the Oneida in danger of sinking. He had seen no lights, and knew of no hail from the Oneida. The testimony of the rest of the Bombay’s crew and the pilot contradicted Eyre’s carefully crafted story. Eyre testified that the Oneida was travelling at a speed of fifteen knots. Each of the Bombay’s officers named her correct speed; eight knots. Eyre stated he knew of no hail from the Oneida, each of the Bombay’s officers heard a hail, two of them reported it to Eyre, who ignored them. Eyre claimed he did not think the Oneida was in trouble, the pilot contended that Eyre asked him if the water in Yokohama Bay was deep enough that the Oneida could rest on the bottom without fear of danger. Eyre stated a lookout had been posted to keep an eye out for signs of distress from the Oneida; her crew reported Eyre ordered no lookout. 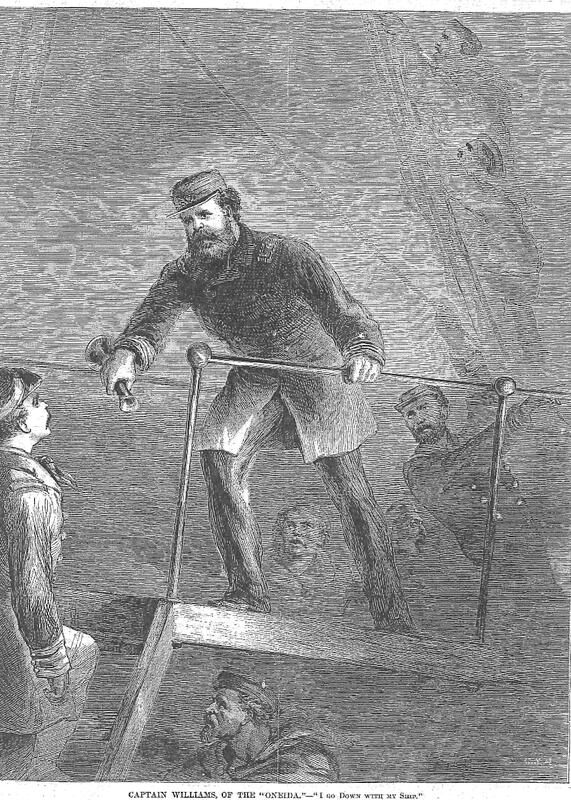 Eyre claimed he stopped the ship for an extended period, the ship’s log reported the engines set at full stop for approximately three and one half minutes, not even long enough for the ship to cease forward movement. Eyre stated he had heard none of the four guns fired by the Oneida. Residents of Yokohama, miles away heard them, as did at least two of the crewmen aboard the Vsadnick in Yokohama Harbor. Even a navigation expert contradicted Eyre’s testimony regarding the rules of the road when entering a bay. In the face of an oncoming ship, Eyre followed the common law for navigation on the Thames River by helming hard a port; the written rules of the road stated otherwise. By helming hard to port, Eyre violated at least three separate naval regulations. According to the expert, the entirety of the fault lay on Eyre. Aided by skilled trial counsel, Court gave Eyre a light sentence. On the first count, the collision’s fault, the Court found that Eyre had been in violation of the rules of the road, but that Oneida deserved the blame. Oneida should have followed longstanding custom rather than naval regulations. On the second count, the Court found Eyre guilty of leaving the Oneida, but gave him a light sentence, six month’s suspension of his captain’s license. The American Minister demanded that Eyre be held for extradition to the United States, his British counterpart dithered. One step ahead of the slow moving minister, Eyre took the next ship out of Yokohama; it happened to be the Bombay. He shipped as titular first mate. A few days later, Japanese fishermen found Captain Williams’ body floating out to sea, naked except for his shirt collar. De Long arranged a burial with all due honor, the American, Prussian, French, and English Ministers, an English Admiral, a large concourse of civilians, a firing party of U.S. Marines in full dress uniform, and the Japanese Governor escorted Williams’ body to Yokohama’s foreign cemetery. The Band of the 1st Battalion, 10th Regiment of Her Majesty’s Army played the Dead March from Saul. British and American troops fired volleys over the grave, and the ships in the harbor dipped their flags in tribute. Eyre appealed to a British Admiralty Court in London for reinstatement of his Captain’s license. The Court refused to listen to the case, if anything, they contended, the Yokohama Court of Inquiry had been too lenient. Eyre’s fate is uncertain. One source has him dying a few months after the Admiralty Court’s refusal to hear the case, but there is a record of an Arthur W. Eyre being married in Tasmania in 1881. The Bombay ran as a mail steamer between Yokohama and Hong Kong for a few more years, before being retired and used as a tea hulk. On Christmas Eve, 1880, fire accidently destroyed her while she lay at Woosing. Japanese fisherman found two other bodies, the American Minister interred them on either side of Williams. The foreign residents contributed funds for a monument to the men of the Oneida, it still stands today over the three men’s graves. 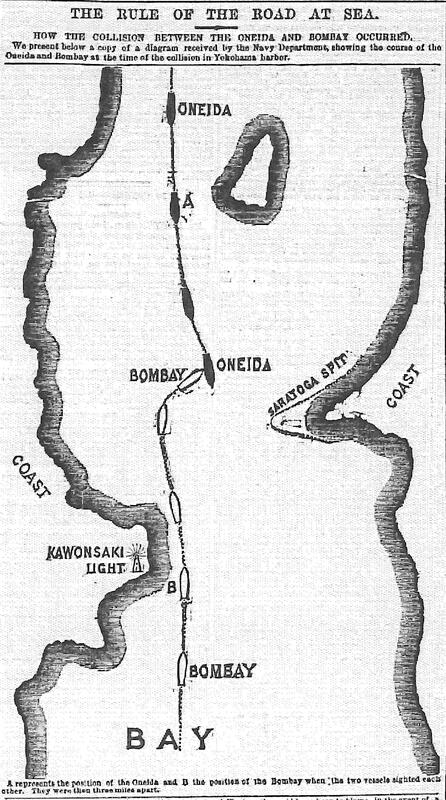 In the 1890’s, the Japanese cleared the Oneida’s wreck while constructing fortifications on Saratoga Spit. They found a number of bones. One of the survivors of the Oneida, his name lost to history, attended the ceremony burying them in a common grave. A monument stood over the grave, a copper plate attached to it identified the remains, until the Japanese removed it in World War Two to melt down for shell casings. It has not been replaced. DeLong returned to the United States, settling in Virginia City, Nevada, where he died of typhoid fever in 1876.Suddards stayed in the Navy, serving as Chief Medical Officer for the entire branch at the time of his death in the 1880’s. Yates too remained in the Navy. Promoted immediately on his return to American soil, he faded into history. For years, the photograph of the Oneida’s officers with their counterparts of the Vsadnick hung in the later ship’s ward room, surrounded by black crepe. Reflecting on the disaster, the loss of Frothingham, Copp, and 118 other men, in distant Yankton, Dakota Territory, the Union and Dakotian published an obituary on the Oneida’s crew. Their memory will live in the hearts of their countryman. It is not difficult to exhibit gallantry, courage, and lofty determination in the shock of battle, when the blood is stirred, and the feelings raised to their highest point. But in the midst of a quiet, peaceful scene, while indulging in the most pleasing anticipations, when suddenly called on to confront death, without the opportunity of escape or resistance, the heroism of these brave men is something indeed for the nation to glory in.